A curious disadventure for the athletes that on the last 6 of June took up 1500m at Marseille’s Meeting. It could have been a perfect race for the participants; for example, the men’s race was composed by 16 participants and most of them had a good PB well below 3’38″00, just think that the first who crosses the finish line, Abdelaati Iguider, stopped the chrono at 3’32″00. The chrono of Iguider is also WL and the other athletes classified behind him, positioned in the first positions of season world’s lists. Unfortunatelly for the runners LetsRun.com, the community that takes care of to clarify the strangest facts of Running World, got suspicious. 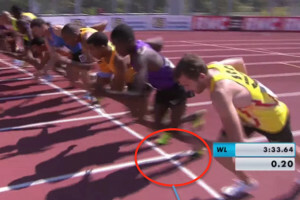 After some analysis of the race’s videos and photographys, it was necessary to nullify all results of 1500m race because the start line was not the right one. Something strange emerged since the first 200m of the race, that was ran in 25″9 and the second one (longer than the first, if we consider the wrong start line) in 30″9; the same anomaly was found also in to the nexts partials.In the end the “misdeed” was discovered. The runners, who were convinced to have ran 1500m, in reality ran 1492.25 m.
Those ones who were not very lucky at Marseilles Meeting will have to wait the next appointment to get their redempion.